As we focus on usability improvements for the 2.3 release, we are looking at ways to use screen space more efficiently AND ways to streamline commonly used workflows. With these goals in mind, we'd like folks to take a look at two newly implemented features in the 2.3 sandbox - a new shortcuts dropdown menu, and a streamlined workflow for entering offline contributions. Prior releases included a "Shortcut Block" which had links to create a new contact record (New Individual, New Organization, New Household), a new group, etc. We've replaced this block with a dropdown menu (select box) with the prompt - create new -. Using a dropdown menu saves a lot of space, and allows us to include lots more shortcuts. You can see the new interface by logging in to the sandbox: Username: demo Password: demo ... then click the CiviCRM menu item. Currently you can create a new contact, a new activity, a new groups AND you can create a new contribution for an existing or new contact - see below :-) We plan on adding several more record types to this list in the coming weeks (new event registration, new membership etc.). In prior versions creating a contribution for a new contact record required several steps. You had to search to verify that the contact wasn't already in your DB. Then you would create a New Individual contact. Then go to the Contributions tab and finally enter the contribution record. Using the new workflow, you simply select "Contribution" from the shortcuts drop-down (create new » Contribution). 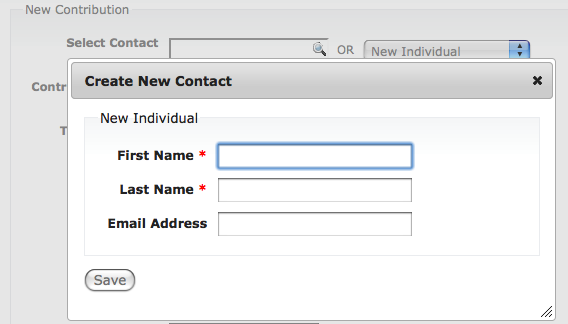 From here you can either select an existing contact, OR create a new one "inline". Check out this flow by clicking here - OR use the -create new- dropdown, OR click New Contribution from the Contributions menu (on top of the screen). Check if your contact exists using the auto-complete Select Contact field. If you find that you need to add a new contact for this contribution, pick the type of contact (- create new contact - dropdown). You'll get a pop-up form to enter the new contact info. A really cool thing is that this pop-up form is controlled by a Profile - so each site can decide what fields they want to be included / required when staff members enter offline contributions for new contacts. We will ship 3 default profiles ( Individual, Household and Organization) - and then you'll be able to customize them by adding or removing fields. We'd really like folks to test drive these new features and give us feedback. We plan to use the same model for "new event registration", "new membership" etc. so it would be really helpful to hear your reactions ASAP! Simply put, this helps me out big time. I'm one of the guys trying to get non-techies to use CiviCRM, but the learning curve is always so high that they never consistently use the program despite having paid for its install. I definitely think this new version will be a lot easier to use. The top menu is great as is the new contribution workflow and shortcuts. i like the configurable profile and was pleased to see that when adding 'current employer' it did create the new org if it did not exist. But when I went to http://sandbox.civicrm.org/civicrm/contact/add?reset=1&ct=Individual to see if same Profile was operating there was given an 'access denied' msg. There was some permission issue on sandbox. Wow! I love the new features! Full text search! Context menu for contact search results! Awesome! I've been using the Drupal Admin Menu and the new Civi top menu is so much better! I love: that it doesn't display on hover (you have to click, which is nice); that it's customizable; and that it has so many helpful links in it! It would be nice if the auto-complete text fields would do text search on the first name too. For example, "Mr Donald R Łąchowski Jr" is difficult to select with the auto-complete. When I paste Łąchowski into the box I get some results, but it's difficult to figure out how to actually type those characters. I expect that when I type "Donald" into the box I get some results, but instead I get no results. I'm so excited to upgrade to 2.3! I like the improvements you have made. I like the magnifying glass icon in the box for looking up an existing contact inline. Can that feature be added to the "In memory/In honor of" area? Also can the "In memory of/In honor of" area be customized with a profile? Since if that area is used, a new contact record is often created.